Hibs’ move towards fan ownership at Easter Road – offering supporters the chance to buy up to 51 per cent of the shares in the Capital club – has provoked plenty of debate since it was unveiled almost two months ago. 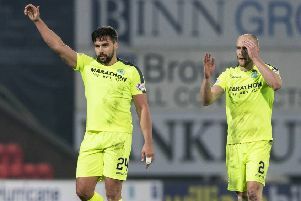 There was some initial resistance although Hands on Hibs later suspended their opposition and the Hibs Supporters’ Association threw their weight behind the proposal. The club were delighted with the early response as the first tranche of 625,000 shares was handed over to Hibernian Supporters Limited shortly after the share issue went live with a growing number of supporters signing up. Bringing the project forward proved to be a lengthy and complex affair lasting the best part of a year. Hibs’ holding company has also agreed to halve the club’s debt and refinance the remaining £5m of loans into a single mortgage on terms acceptable to the club. So it is little surprise many fans still have questions to which they are seeking answers. Today, Hibs chief executive Leeann Dempster took time to respond to questions raised by readers of the Edinburgh Evening News . .
EVENING NEWS: How do fans buy shares? LEEANN DEMPSTER: There are two ways to buy shares from the club. If you are a current shareholder you will have already received an Information Memorandum which contains an application form. It is a simple process to complete the application and return it to the club. If you are not a shareholder you can qualify by being on the club database. You should have received a letter with details on how to request an information memorandum from the club. Completed application forms together with a cheque in payment should be sent to the ticket office for the attention of the share manager. If you believe you should have had a letter but have not, as a current shareholder or supporter, email shares@hibernianfc.co.uk with your query. EN: Can fans buy shares by paying by instalments? LD: No. The minimum purchase is £200 and you can buy shares as often as you want while the share issue is open. Please contact the share manager every time you need an application form. They will have to check the details of your first purchase before issuing a second application form. If you want to pay by direct debit or contribute on a regular basis you could consider becoming a member of Hibernian Shareholders Limited, see www.hiberniansupporters.co.uk for details. EN: Is the offer for supporters the same as the offer to existing shareholders? LD: Yes, the offer is identical but the process is different. Shareholders have received an information memorandum which contains an application form. Supporters should use the back of the letter they have received to request an information memorandum. The letter needs to be counter-signed by an Independent Financial Advisor (IFA). EN: Will fans get a share certificate? LD: Yes. Everyone who buys shares direct from the club will receive a share certificate in their own name. EN: Is there a minimum level for the share issue below which it will not proceed? LD: No, there is no minimum level for the offer. It will be dealt with on a first come first served basis and every valid application will receive shares as long as there are shares available until the limit of 62.5million shares and £2.5m in subscriptions is reached, or the share offer is closed. EN: What is the share price and what is the minimum and maximum number of shares that can be applied for? LD: There are 11 price points beginning at £200. EN: Why do fans need IFA approval? Would an appropriateness test not have sufficed? LD: You do not need IFA approval if you are already a shareholder. If you are a new shareholder you need an IFA to countersign your application form to receive an information memorandum. The shares cannot be traded on any stock exchange so the IFA checks to ensure that you understand the shares cannot be traded or easily turned into cash in the future and that you are not over committing your resources by acquiring shares. Self-certification or the ‘appropriateness test’ does not satisfy the process put in place to comply with the Financial Services and Markets Act 2000 and the Financial Control Authority regulations. EN: Is there any way regular supporters – not on the database to qualify for shares – can get on the database and qualify to take part in the share issue? LD: We are sorry, if you are not already on our database or you are under 18 or you live abroad then you are not eligible to buy shares. The only way to get on the database is to buy a season ticket or other match ticket. Once on the database a supporter can approach the club to see if they meet the criteria to receive a supporter letter. Further supporter letters can be issued to eligible supporters. EN: Can overseas supporters on the database buy shares? EN: If existing shareholders buy shares, can they transfer them to someone else – and if so are there any rules around the numbers they can transfer? Will the person they transfer shares to get a certificate and full shareholder rights? And is there any restriction on who they can transfer to? LD: Shareholders must buy shares in their own name and comply with the terms and condition of the Share Issue which includes a commitment to hold the new shares for at least six months. After that, any shareholder can, subject to the provisions in the club’s Articles of Association, transfer shares to family members or third parties. Each person to whom shares are transferred will receive a Share Certificate from the club confirming the number of shares they hold. There is no minimum number or other restrictions on the number of shares which can be transferred. Also, there is no age limit so that shares can be transferred to children or grandchildren who are under 18. Shares can also be transferred to individuals who are resident abroad. Transfers are subject to the provisions of the Articles of Association and anyone seeking to transfer shares after the six month period should contact the share manager at that time for guidance on the procedure to follow. EN: Can fans transfer some of their existing shares to a friend so that they can then apply for shares as a shareholder and not have to use an IFA? LD: No. The offer to shareholders is only open to shareholders who were on the share register at January 9, 2015. If you join the register after that date you are not eligible to apply through the offer to shareholders but you can apply through the offer to supporters. EN: If a fan buys 5000 shares now, can they buy more at a later date? LD: Yes, you can make a number of separate purchases when it suits you. When you want to make a second or third purchase, please contact the share manager for another application form. They will have to check the details of your first purchase before issuing another form. EN: The offer is restricted to 18 and over. Can fans buy shares for their children and grandchildren, or as a gift for someone else? LD: Yes. Buy the total number of shares you need in your own name. You will have to own them for six months. Thereafter contact the club to arrange for them to be transferred into the name of your children and grandchildren. EN: How can fans, not on the database, who don’t qualify to buy shares direct but want to support the club, do this? LD: Hibernian Supporters Limited is a collective ownership vehicle open to anyone. Anyone can donate via the website www.hiberniansupporters.co.uk and that includes supporters living overseas. You won’t own shares directly, but you will be a member of a company set up specifically to buy and hold shares on behalf of all of its members, you will get a membership certificate, and you will have a vote in how the company is run.